﻿The Old City of Jerusalem is surrounded by four kilometers (2.5 miles) of walls built by the Ottoman Sultan, Suleiman the Magnificent, in 1540. Seven gates serve as points of entry into the Old City, but the New Gate is just that -- relatively new. 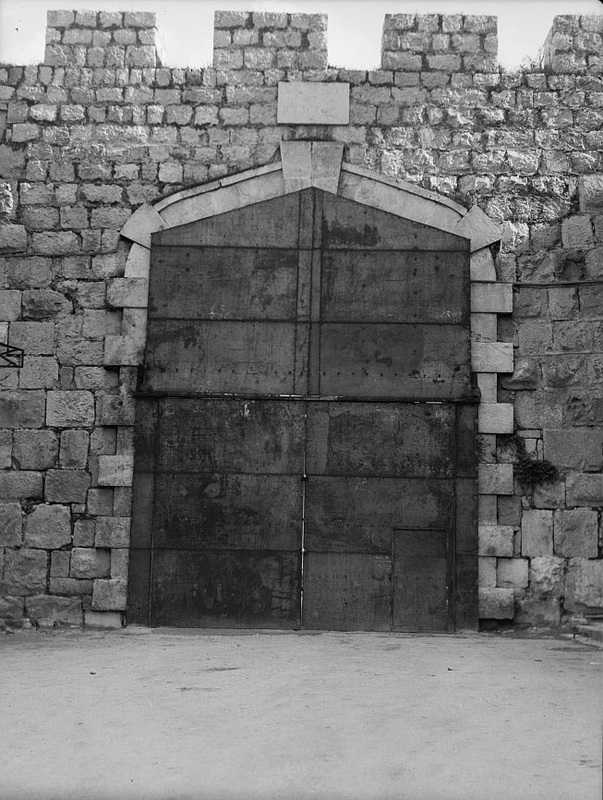 Unlike the other ancient gates, the New Gate was opened in 1889 by the Ottomans, giving direct access to the Christian Quarter of the Old City. Benefiting the most were the Christian residents of the nearby Russian Compound and the French Notre Dame hospice across the street. 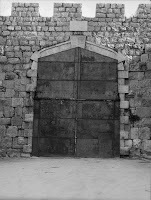 The New Gate is located between the Jaffa Gate and the Damascus Gate. 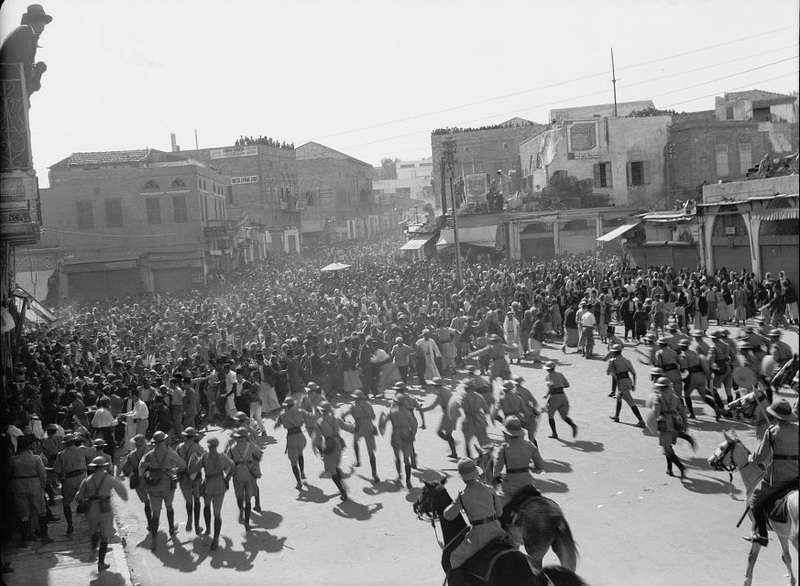 cordon stopping the procession, Oct. 13, 1933"
In 1933 Arab riots broke out in Jerusalem and clashes with British police erupted at the New Gate and the Jaffa Gate of the Old City. What triggered the 1933 riots? Arab discontent on account of Jewish immigration and the sale of lands to Jews, which has been a permanent feature of political opinion in Palestine for the past ten years, began to show signs of renewed activity from the beginning of 1933, developing in intensity until it reached a climax in the riots of October and November. [Editor's note: 15 years before Israel's creation.] ... This [immigration] increase found its origin mainly in the favourable economic conditions of the country, due to a large extent to influx of Jewish capital and to consequent creation of new openings for employment. [T]he collision of Arab demonstrators with the Police resulted in five constables and eleven civilians being slightly injured. The total casualties in the subsequent rioting in Jaffa, Jerusalem, Haifa and Nablus were one constable and twenty-four civilians killed or died of wounds, twenty-eight constables and two hundred and four civilians wounded. During the Arab Revolt (1936-1939) British authorities were quick to close the New Gate to prevent free movement of rioters and marauding gangs. In 1948, Jewish fighters failed to break through the gates of the Old City to relieve the fighters in the Jewish Quarter and to conquer the Old City. 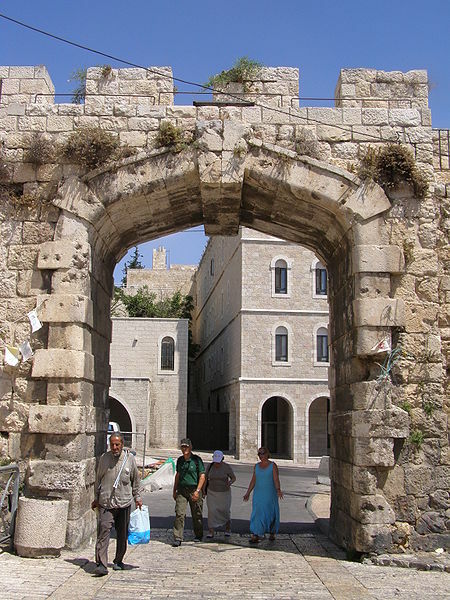 The Israeli Defense Forces captured the Old City in June 1967 and opened the New Gate for traffic and pedestrians. 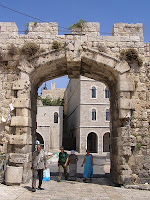 See previous photo essays on the Zion Gate, Damascus Gate, Golden Gate, Dung Gate, Jaffa Gate and Lions Gate. The next gate: Herod's Gate. To receive Israeli Daily Picture, enter your email in the subscribe box in the right sidebar. It's free!